Travelling is a funny thing. No matter where you go, there you are. And being there exposes you to issues. Some good, others disturbing. An issue on this trip has been the many forms of religion, and its heart , FAITH- a belief in an ideology , someone or something. And how they do or do not co-exist. War, as an extension of an ideology supposedly shapes character, consolidates nations and along the way constitutes a principal cornerstone in the progress of civilization. Possibly an illogical belief in the occurrence of the improbable? This is the story of ideologies stretched to breaking point. It is not meant to be an attack on the USA or its people, in fact the war in this story was hidden for years from the American people, their Congress and the rest of the world. It is more than 50 years since the first US combat troops entered Vietnam in March 1965. As the Vietnam War raged, Washington noticed that communist forces had spilled over into neighboring Laos. Negotiators in Geneva agreed that Laos would remain neutral. The United States feared the spread of communism, resulting in the C.I.A. directing a covert operation in Laos known as the Secret War. 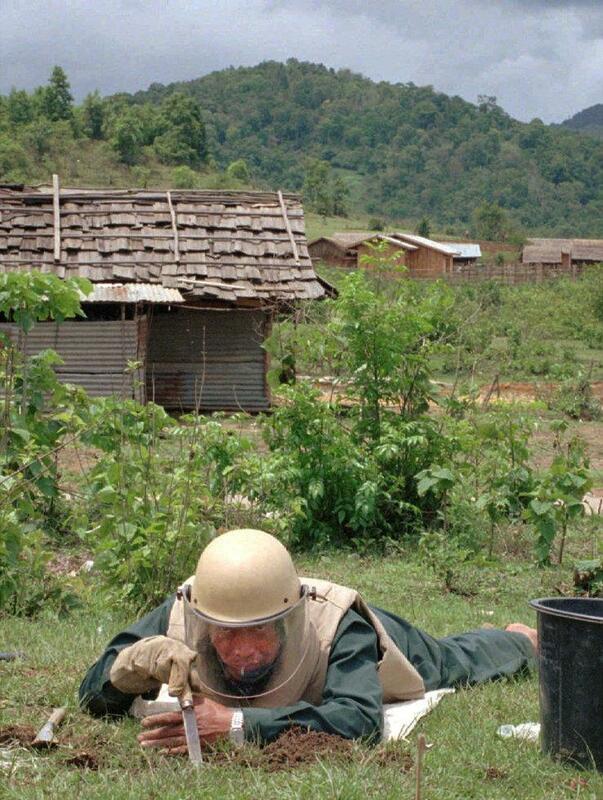 Part of this secret war involved recruiting tens of thousands of local Hmong boys and men as soldiers, as opposed to committing US troops to a neutral Laos. The other facet was an intensive carpet bombing of the country.. 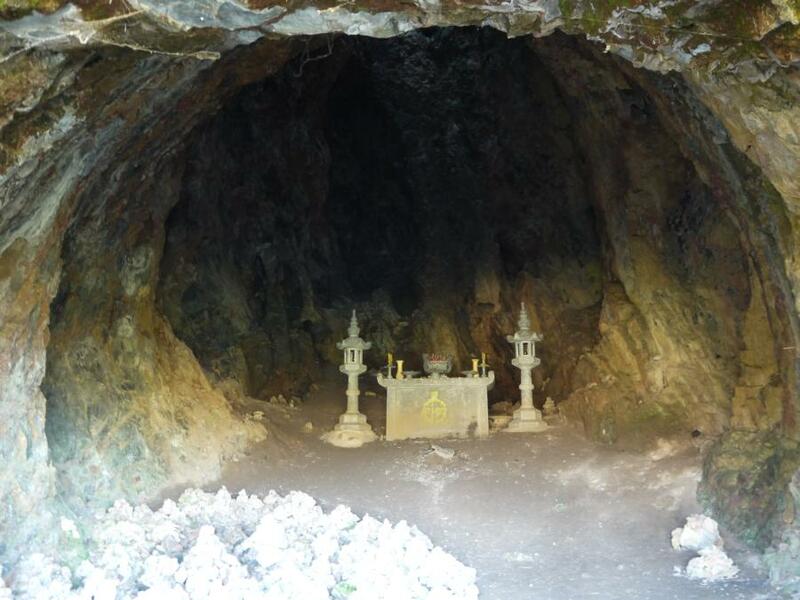 It has been estimated that the Hmong lost nearly 100,000 people during this secret operation. 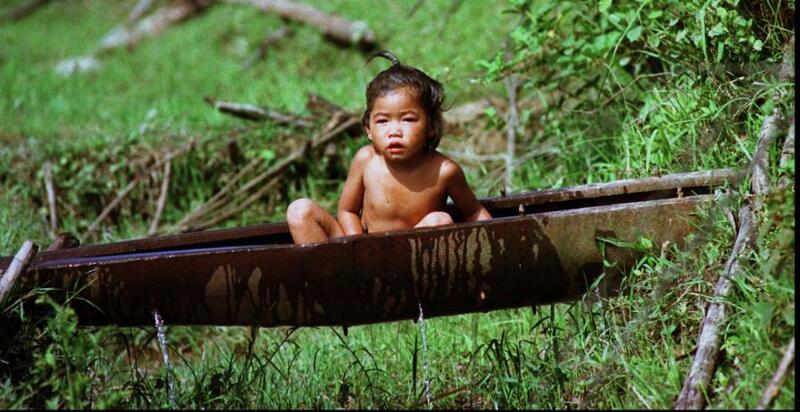 The Hmong were later abandoned by the CIA when the US withdrew from Vietnam while Lao remains a communist state today. Persecuted by their own government for supporting the CIA hundreds of thousands of Hmong refugees fled to Thailand seeking political asylum. 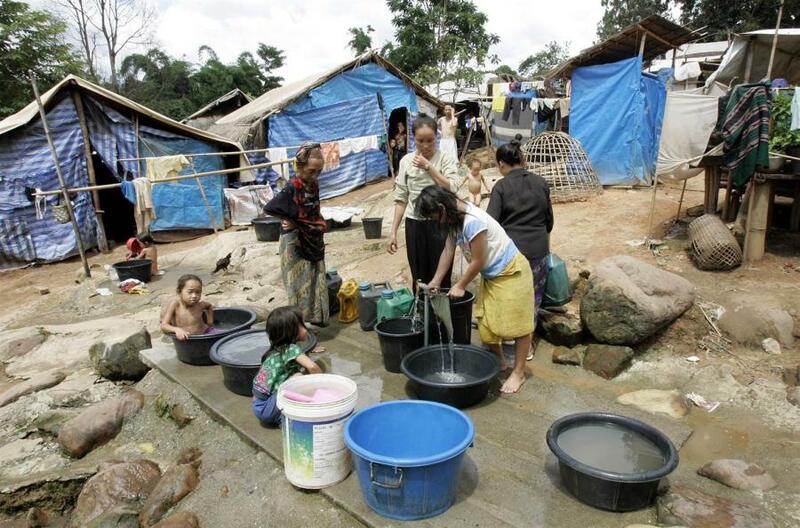 Thousands of these refugees have resettled in Western countries including the US while those that remain in Laos fled deeper into the jungle, where many remain today, still hoping the United States will return to save them. And that was only one part of this clandestine war. The other part was the most concentrated bombing campaign in history , aimed at destroying the communist North Vietnamese supply routes along the Ho Chi Minh trail. This trail consisted of a network of roads, paths and rivers running through Laos and Cambodia. It was used to smuggle people & equipment from North to South Vietnam. As the trail was hidden from aerial observation by natural and man made camouflage America’s strategy was to subject the trail to intensive bombing, creating thousands of deaths and displaced civilians attempting to escape the onslaught. 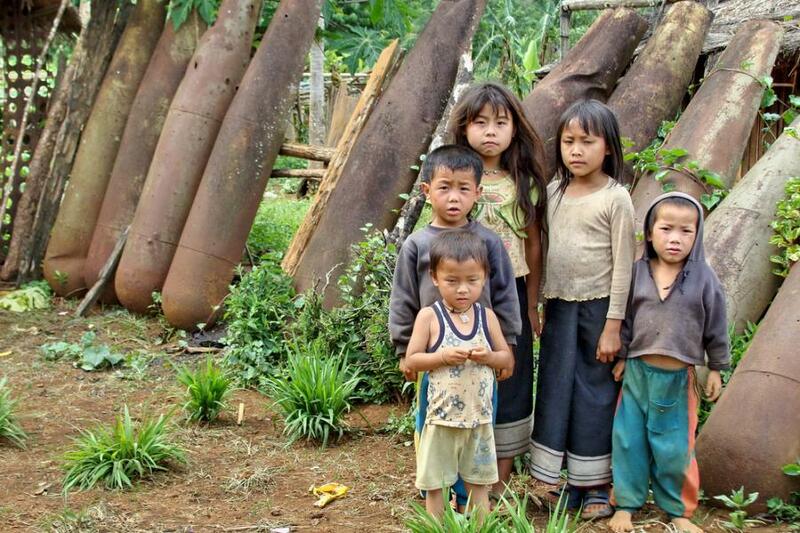 The US dropped more than 270 million bombs in Laos. 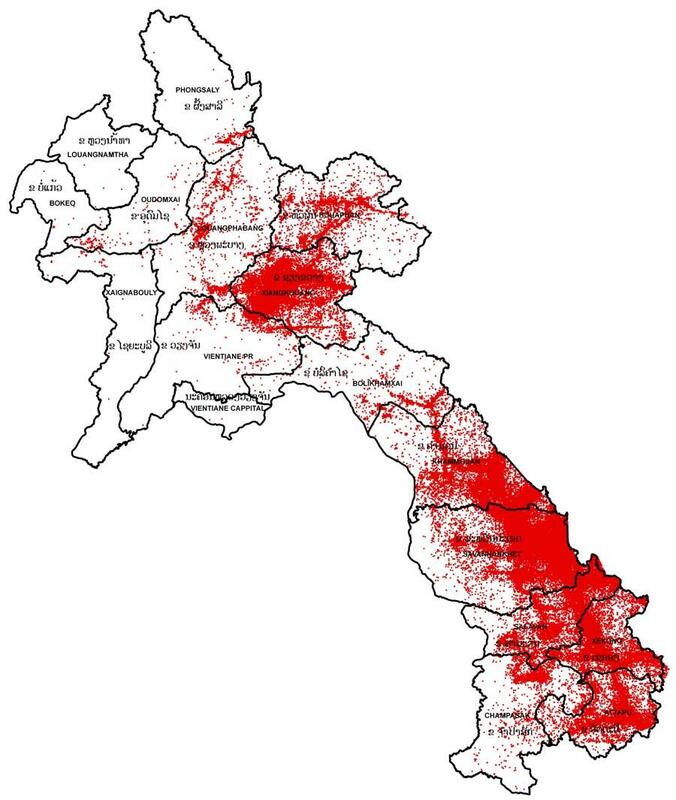 These bombings equal to a planeload of bombs every 8 minutes, 24-hours a day, for 9 years making Laos the most heavily bombed country per capita in human history. 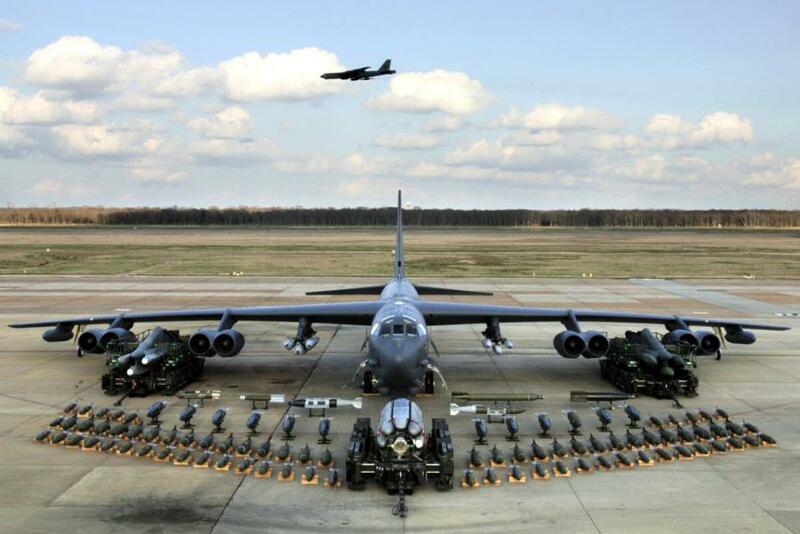 More bombs were dropped here than in the entire WW 2. In a country the size of the UK. 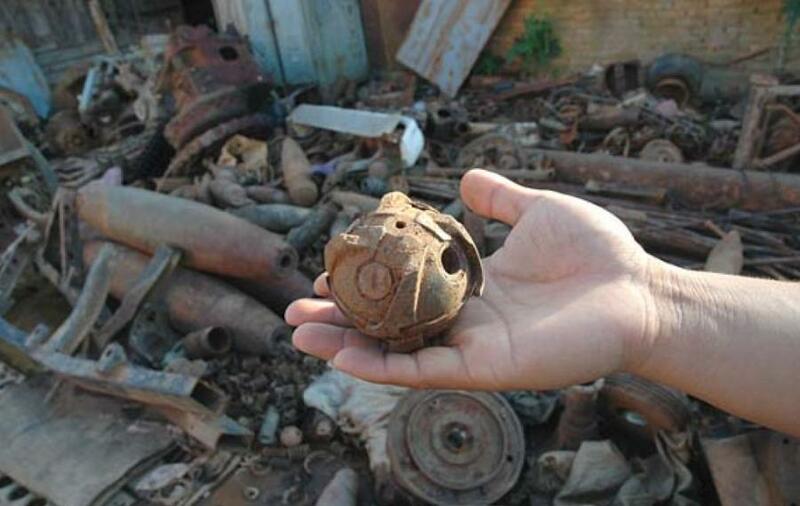 The most commonly used ordnance by the Americans were cluster bombs, dropped in casings designed to open in mid-air and scatter hundreds of munitions(bombies) over several hectares. 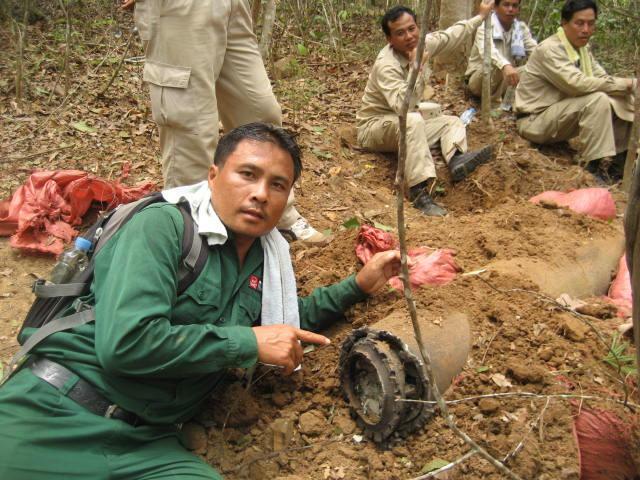 Each cluster bomb casing could carry hundreds of Bombie derivatives , all designed, refined and produced in the free world. Bombies came in various forms. Some bombies were designed to explode on impact, each spreading 300 steel pellets in a lethal 30M radius. Others were designed with incendiary devices to start fires. Some had delayed fuses which would create fear on the ground via random timed explosions. Others were designed not to explode on impact but would rather spread trip wires for unsuspecting locals and animals to trigger. 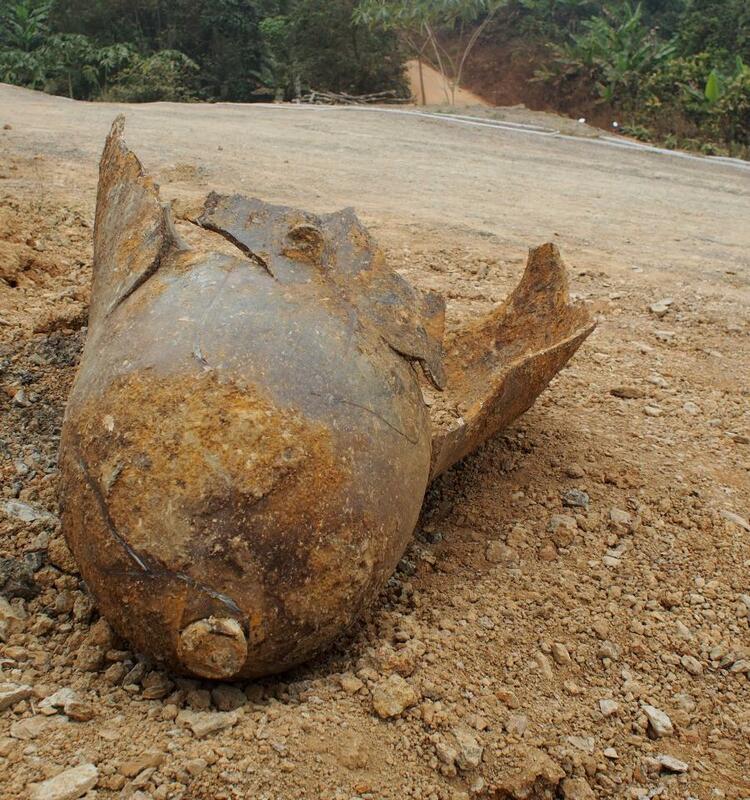 It is estimated that 80 million cluster bombs did not explode when dropped, leaving the country massively contaminated with bombies, as dangerous now as when they fell 50 years ago. 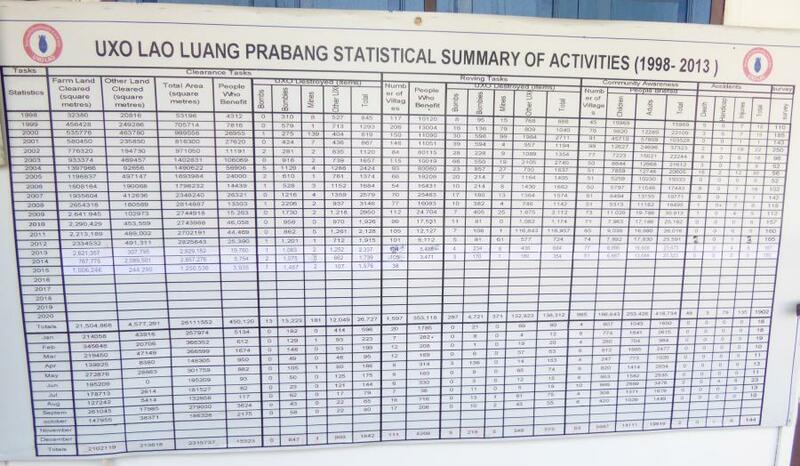 Despite the efforts of organizations such as MAG and UXO LAO only 1% of Laos territory has been cleared so far. 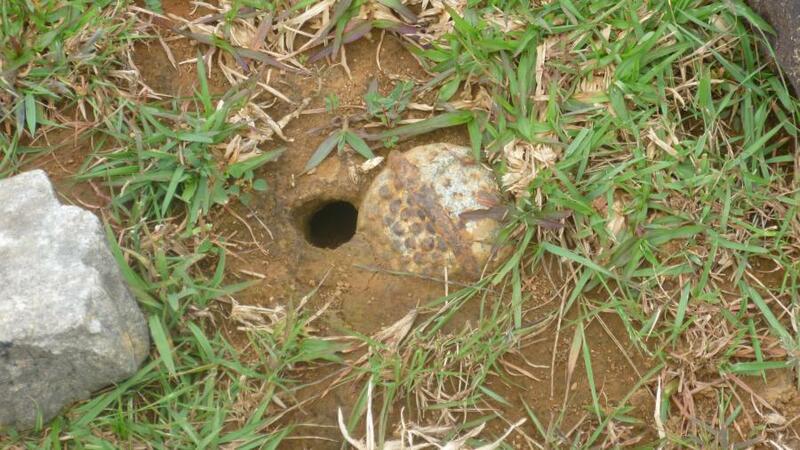 These unexploded ordnance are called UXO and they claim on average of 500 victims a year, mainly children (who are often attracted by their toy-like shapes ) , farmers who are forced to work on their contaminated fields and scrap metal collectors. Many accidents in remote areas often go unreported. 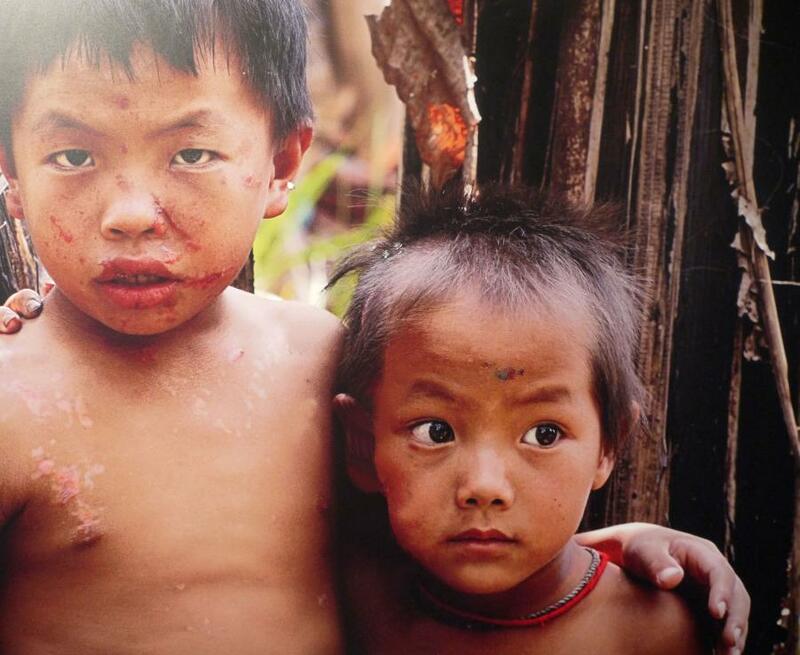 Yukhu (left) & Yavhu were lucky to survive by running away from a bombie their friend discovered. The friend and another boy unfortunately died from the explosion. 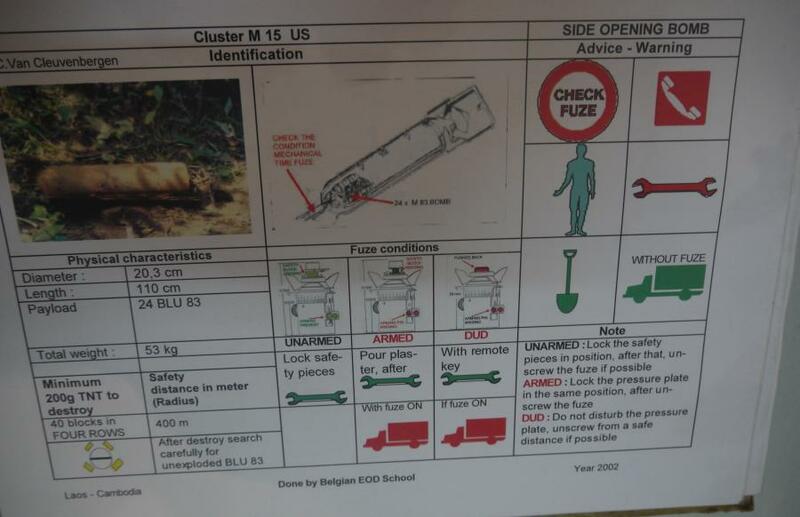 People living in UXO contaminated areas have to learn to accommodate, to some degree, these deadly objects in their lives. 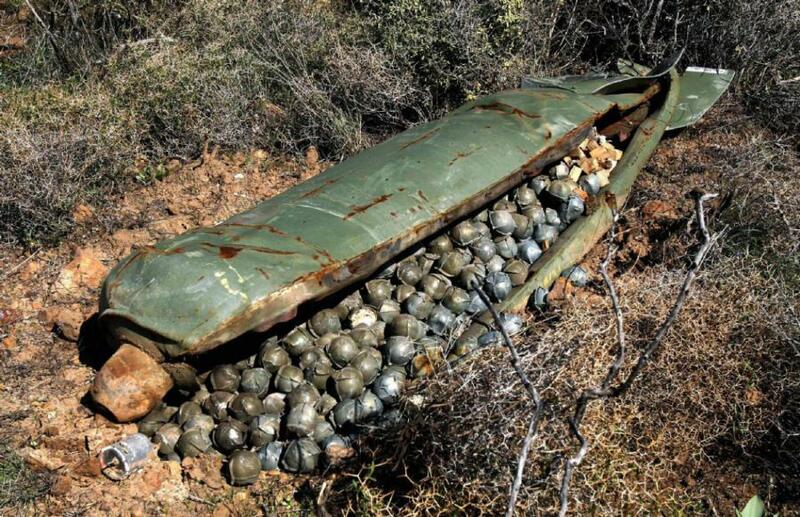 Bombs and other war hardware are used as fences , house foundations and even boats. UXOs affect not only the daily life of millions of people but the long-term development of the country by delaying the construction of clinics, schools and factories. At the current pace, it will take more than two millennia to clear the country. 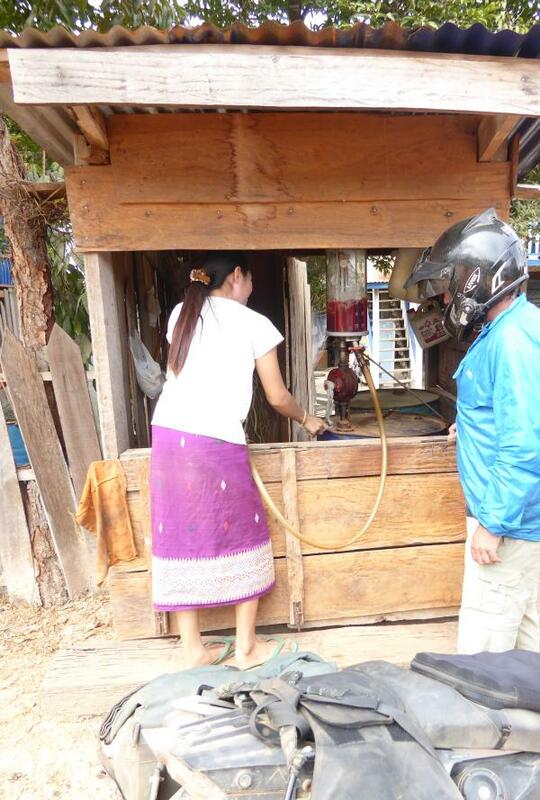 Despite a goverment ban, UXO scrap metal has become a booming trade in Lao PDR. For many of the impoverished , supplementing their low incomes by collecting and selling the metal outweighs the considerable risk of death and injury. 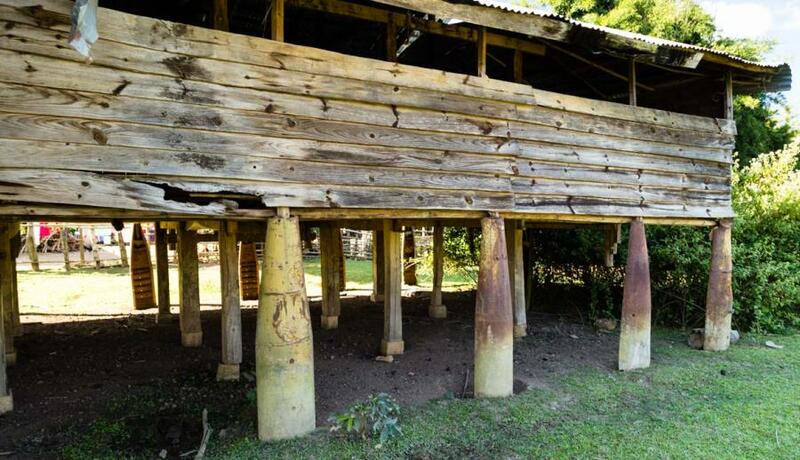 Depending on its quality , metal can fetch between 1500 & 5000 kip a kilogram (Us$ 0.17- $0.58); a 700 pound bomb will sell for around 17 million kip ($200)-up to two-thirds of a rural farmer’s or teachers yearly income. The human cost is immeasurable. 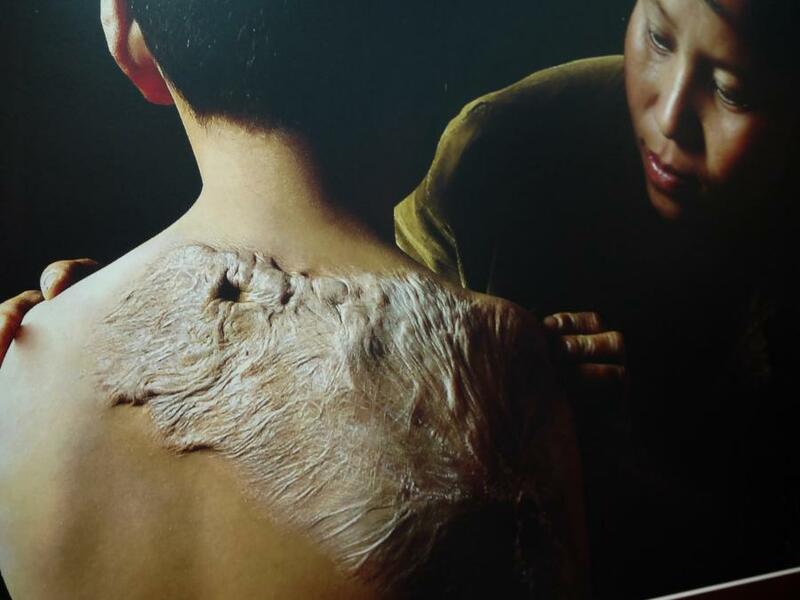 Because the trade is outlawed , people are reluctant to report incidents. The influx of cheap metal detectors has not helped matters either. For $12 a metal detector can be bought at local markets or on hire purchase from scrap metal dealers. These detectors have become a common household item in many rural homes, with adults and children alike hunting for the remains of bombs and submunitions. 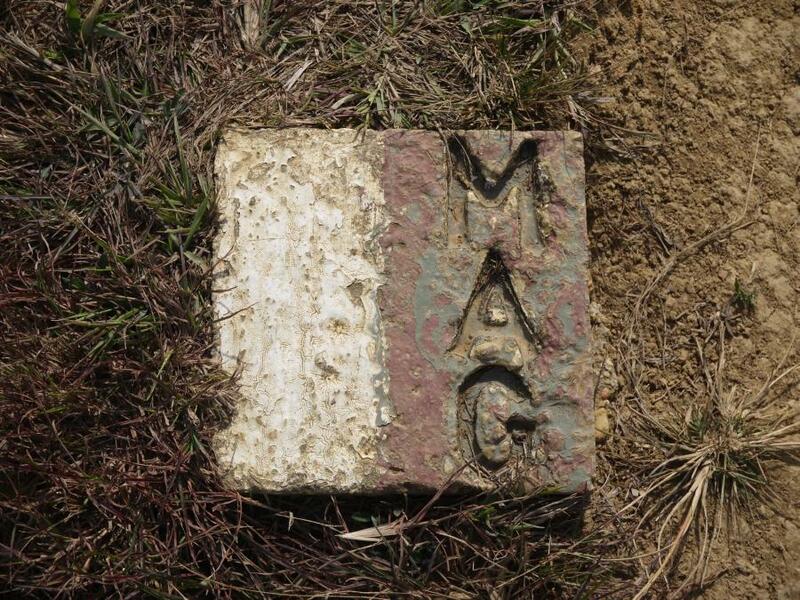 The impact of UXO extends far beyond those directly effected by a single accident. 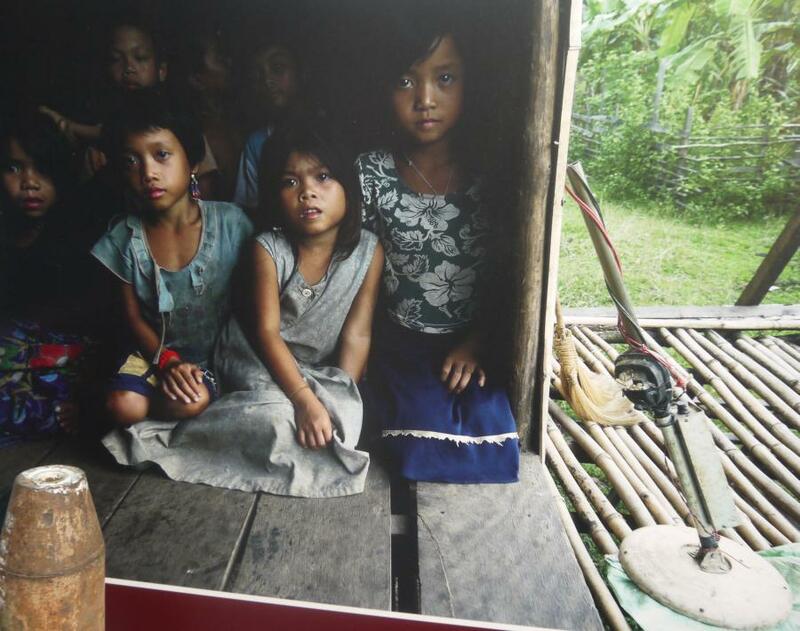 The fear of UXO in villages, fields, forests-a community’s entire environment- can stop people using land for agriculture, reducing their ability to feed their families and earn a living. 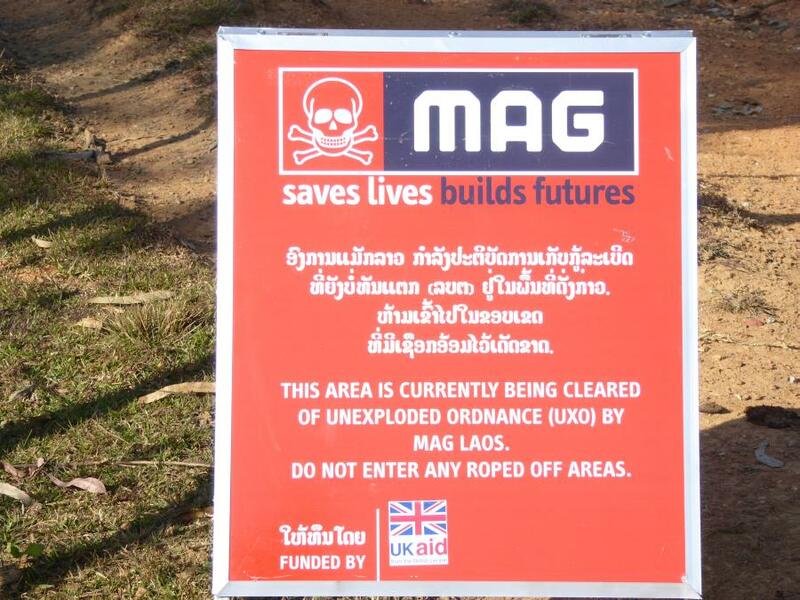 It is estimated that it will take more than 200 years to clear Lao of these UXO. 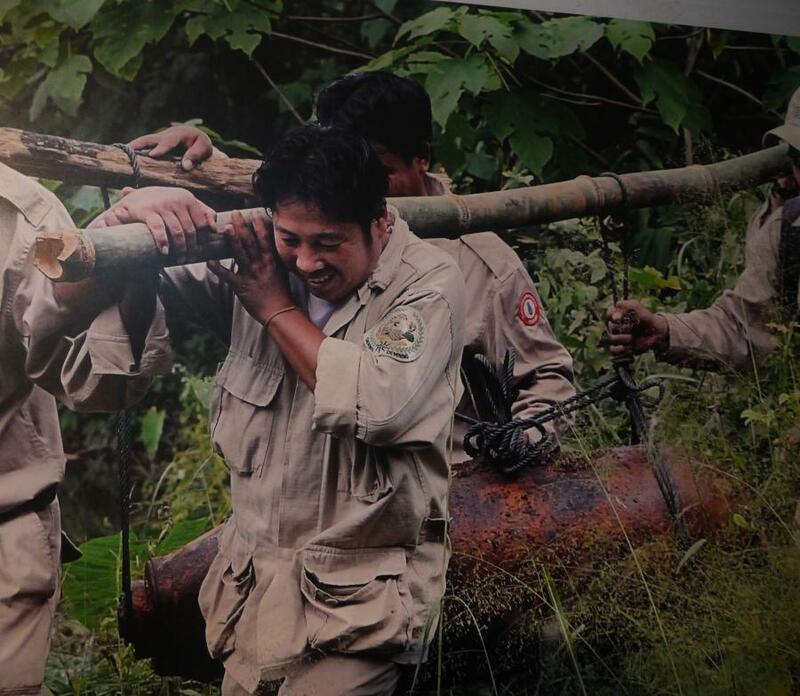 Organizations such as UXO LAO and MAG working tirelessly in what seems like and insurmountable eradication task. This is the Bomb clearing “bible” used by the clearing organizations. 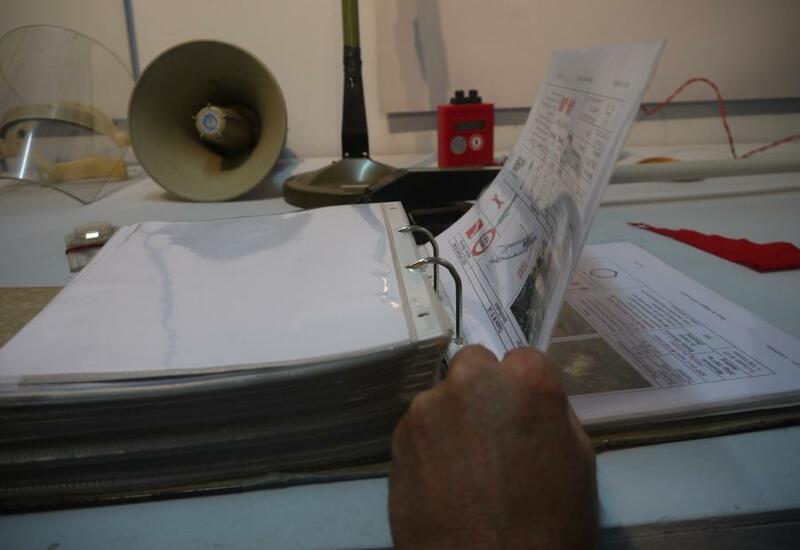 It is a catalog of the many different types of explosives that could be encountered. Each page has a description of the type explosive and how to deal with it. Given the amount of UXO we decide to follow the main road south ( according to the The Reise Know-How Verlag GmbH Laos map , 2014 edition). 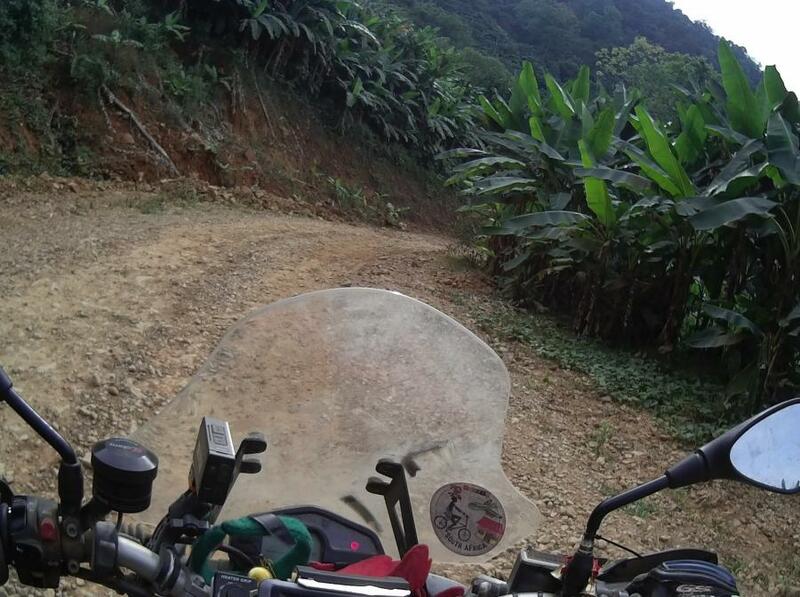 Somebody in this organization needs to check their product as the main road on their map turns out to be a 190 km track through the jungle. And this . Left of the white segment areas have been cleared of explosives Right of the Red marker no clearance has been effected . The following video gives an oversight of the Secret war, its consequences and the reality that there is always someone less fortunate than oneself. Our daily issues pale by comparison. 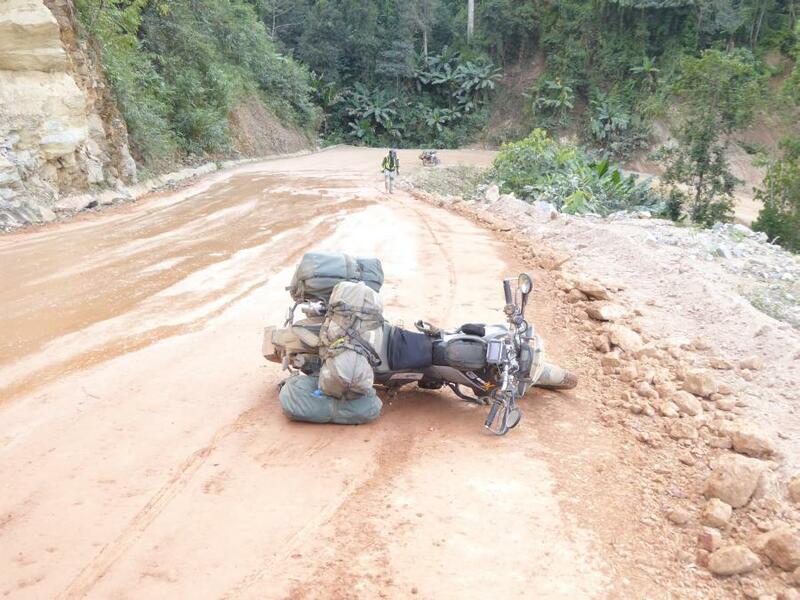 Yes,bombing the ho chi Minh trail. Attempting to interdict the north vietnamese moving Russian and Chinese war materials to the south,in order to kill the south vietnamese and US military. Laos and Cambodia ” neutral countries”…why don’t you tell that to the Chinese and Russians? Brought to you courtesy of the leader of the “free world”…. Oh no! How terrible. I knew nothing about this. The US also used chemical warfare( agent orange) in Laos well as dropping booze along the trial in the hope that smugglers would be too drunk to carry onwards! This is one of the craziest stories I have ever read. How can people do such things ? Anyway enjoy your trip I am sure Zuma will still be here when you get back.